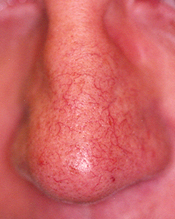 Extremely common, facial telangiectasia is often referred to as "broken capillaries." These patches of dilated veins aren't actually broken, but are simply large enough to see with the naked eye. They usually affect the cheeks, the nose, the chin, and also (with men) the beard line. The precise cause is unclear, but most physicians believe they are the result of years of trauma to the skin -- most commonly, excessive exposure to the sun during a patient's youth. They are more common in blond hair, blue-eyed people. Facial telangiectasia can additionally, run within the family. Frequently, dermatologists misdiagnose this condition as rosacea because rosacea can also have individual visible vessels along with the typical reddish skin common to rosacea. 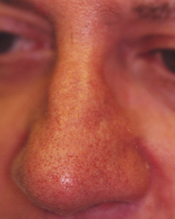 Even this generalized facial discoloration can be effectively treated with certain lasers. This method of treatment is superior to antibiotics--either oral or topical. Laser treatment for telangiectasia involves no anesthesia, no downtime and an immediate disappearance of the treated vein.